Mums are going to love our NEW Floral Gold theme..
Bountiful Roses in Bloom. . 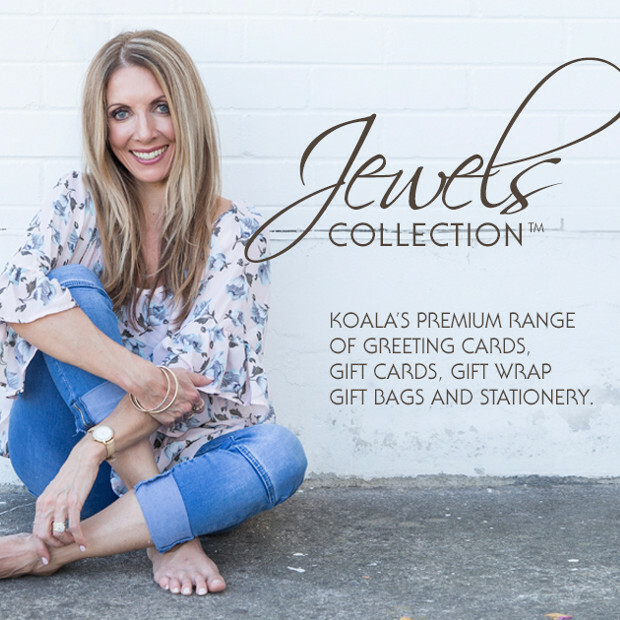 The Award Winning Jewels Collection is Koala’s premium range of greeting cards, gift cards, gift wrap and gift bags which are designed and printed in Australia.This elegant range has been designed to satisfy the astute buyer seeking luxury at a reasonable price. 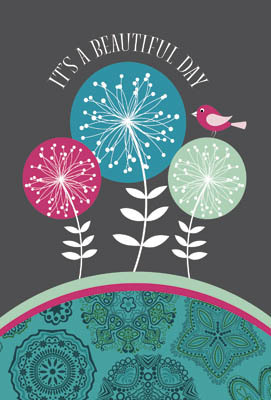 This complementary range of images enables buyers to mix and match products for a more personalised look. The range is displayed in a four sided colour themed rack, maximising the visual impact and ease of product coordination and selection. 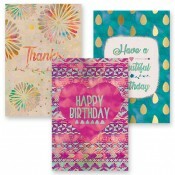 Designed to reflect a fun and summery lifestyle Aztec Fusion is a relaxed bohemian vibe in a greeting card. Drawing inspiration from resort and beachwear fashion it is sure to be popular with the young and young at heart. 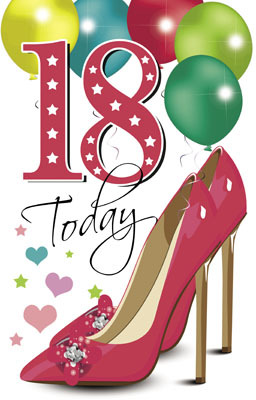 Titles: 8 gift cards, 12 Greeting, 3 gift wrap, 1 gift bag Print: Full colour print with gold foil highlights on cards. Stock: 300gsm Hessian stock Envelope: White hessian lick & stick envelope. Gift Wrap: Double sided wrap printed full colour on both sides. Gift Bag: Full colour print with a matte varnish finish. A fresh coast breeze with the touch of aged timber tones. 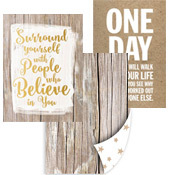 This colour themed side is based on simplicity of nature’s organics with inspirational life quotes. 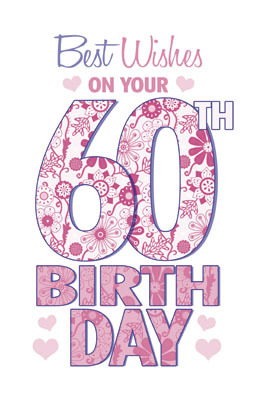 Titles: 8 Gift cards,12 Greeting, 3 Gift Wrap & 1 Gift Bag Print: Cards neutral wood tones printed inside and out. Double sided wrap printed full colour. Bags full colour all sides. Stock: 300 Gsm Hessian stock. Finish: Spot varnish, Bags matt varnish with ribbon or silk handles and card insert. Envelope: White hessian lick-&-stick envelope. Bringing back a softer side, NEW RELEASE Floral Gold is a warm and feminine addition to the Jewels family. 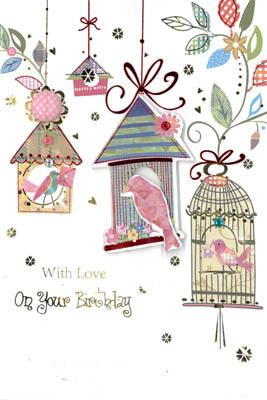 It uses watercolour florals and highlights of gold to create beautifully wild and heartfelt sentiments. Titles: 8 Gift cards, 12 Greeting, 3 Gift Wrap & 1 Gift Bag. 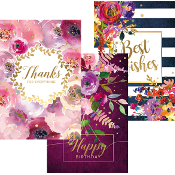 Print: Cards watercolour florals with gold foil highlights. Colour printed inside and out. Stock: 300 gsm Hessian stock. Envelope: White hessian lick-&-stick envelope. Gift Wrap: Double sided wrap printed full colour on both sides. Gift Bag: Full colour with gold foil one side, stock is a matte varnish. 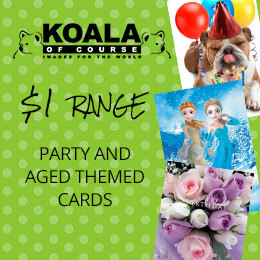 A greeting card range that shows luxury and opulence. Titles: 8 Gift cards, 12 Greeting, 1 Gift Wrap & 1 Gift Bags. 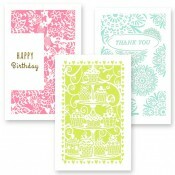 Print: Cards Black and white designs with gold foil highlights. Colour printed inside and out. Stock: 300 gsm Hessian stock. Envelope: White hessian lick-&-stick envelope. Gift Wrap: Double sided wrap printed full colour on both sides. Gift Bag: Full colour all sides with gold foil one side, stock is a matte varnish. Innovative and intricate laser cut designs in white card backed by coloured paper creating a 3 dimensional effect. Our Jewels Silhouettes are a beautiful addition to our stunning Jewels Collection. This soft and delicate laser cut imagery range contains a variety of colour inserts which create a 3-Dimensional gift element to each card. 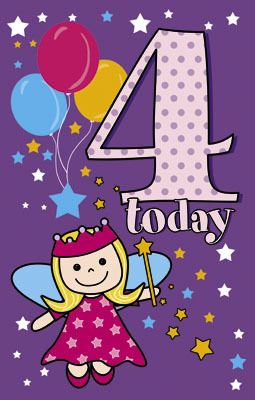 Designs have been carefully created to meet the needs for all occasions and age groups. 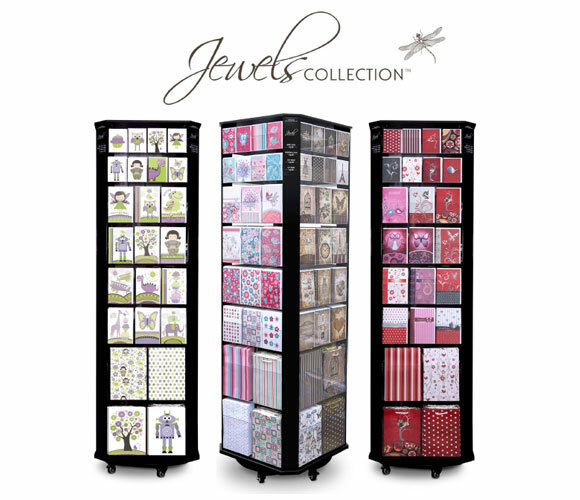 In the chaotic worlds we create for ourselves its more important than ever to be organised and with the NEW Jewels Stationery range you will be. 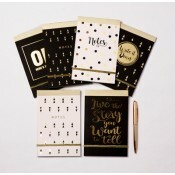 The range includes stylish Notebooks and Notepads enhanced with gold foil treatments and magnetic Shopping/To Do Lists. The perfect add-on gift! Titles: 2 Notebooks (64pg Ruled), 3 Notepads (50pgs Ruled), 4 Shopping Lists (50pgs). Stock: Covers 350gms, pages 80gsm. Finish: Book and pad cover matte varnish with gold foil treatment.